You know the scenario; the other half has been moaning at you for half the year to get those shelves up and after tripping over those books sprawled out on the floor, you finally come to the conclusion that you should probably just do it. How frustrating is it then, when you dig the tape measure out from the bottom of the toolbox, to then try and draw a straight line while the tape measure’s weight hangs there. You’re then putting pressure on the tape while attempting to draw a straight line. Or perhaps you use a fold-out rule but this causes you to draw bumpy lines where the rules join one another! Annoying right? Well, we have the solution! 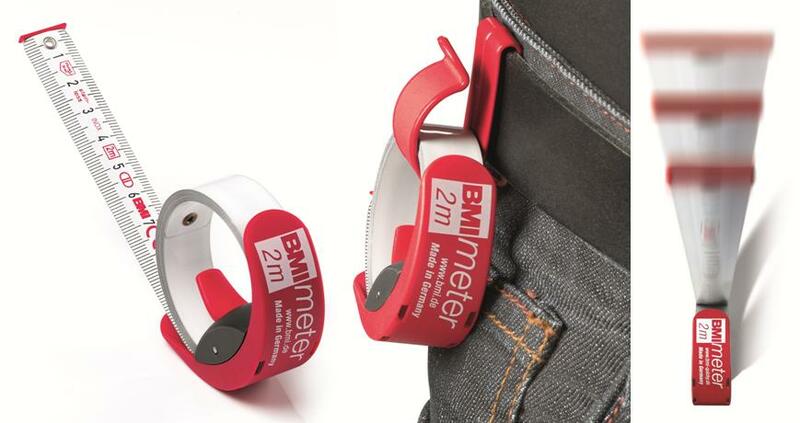 The innovative design of the BMImeter not only prevents these problems from occurring but also performs as both a tape measure (with tape stop) and a rule. It has the perfect place in your store - like no other tape measure/rule on the market! - Tape lies flatly on a table, allowing precise markings and easy transfer of measurements. - Tape unrolls on its own due to a special treatment of the refined steel. The BMImeter is truly one of its kind. There’s no excuse not to put that shelf up now!